This is the first of three award posts! Apologies for this taking so long. The others will follow shortly! 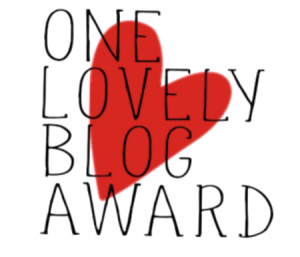 Novus Lectio has kindly nominated me for the One Lovely Blog Award. I would like to say a heartfelt thank you to my anonymous blogging friend who writes insightful and thought provoking poetic musings. 1- Thank the person that nominated you. 2- Provide a link to their blog. 4- Display the award on your post of the Award. 5- List seven interesting facts about yourself. 6- Nominate other bloggers for this award and leave a comment on one of their posts to let them know you have nominated them. OK, so 7 interesting things about me. Well I have very few options left after posting fifty of them back in the autumn! Will see what I can do. 1- I am fascinated by antique microscopes and would collect them if I had money and space. 2- I have always had an interest in lettering , though you would not know it from my handwriting. I would also collect Bill Graham Fillmore concert posters, again if I had the money and space, because of the very free approach to lettering (and sometimes legibility!). I once did a weekend calligraphy course but it was far too disciplined for me – but it did cure a trapped nerve in my shoulder (long story). 3- I am good at procrastination…which is why it took so long to respond to these nominations. 4- I want to experience Scuba diving but there is a minor obstacle to this in that I can’t swim. Technically this is OK as diving is basically controlled sinking and I am sure I could manage that 😀. Coming back up again might be tricky though… Maybe a project for 2018 could be to learn to swim? 5- I love the art of Frances MacDonald and the designs of her brother-in-law Charles Rennie Mackintosh. The recently destroyed library at the Glasgow School of Art (designed by CRM) was my favourite room in the world. 6- I have never framed and hung any of my artwork in my own home, and probably never will. Don’t ask me why as I don’t know! 7- I rarely smile and have never, to my knowledge, laughed out loud. Don’t take it personally – it is a combination of introversion and my natural basset hound resting expression. I love making others smile or laugh though. My nominees! No obligation at all, I know some people don’t like these awards and/or struggle for time. Caroline is a new blogger – go and say hello! Thank you Darren so much for considering my blog worthy of nomination…that means a lot to me!! This is my 4th time being nominated for an award, last one only yesterday so 2018 is getting off to a busy start! But I’ve realised that it’s not the award at all that matters but the fact that another blogger has me in mind, likes what I have to say and sees value in my posts enough to actually recommend others to spend some of their valuable and scarce free time to checking out my blog! What I love about your own response to the nomination Darren is the honesty and uniqueness of your answers! I’ve learned so much about you. Thank you for the nomination! I have learned more about the amazing you! We have a lot in common, too! You are quite right. The award matters less to me than knowing that one of my friends here was thinking of me when they wrote it. I do enjoy your blog and was delighted to nominate you. Glad you liked my answers too. People i know in person tell me i don’t let people in. Well actually I rarely volunteer info but don’t really have secrets when someone asks a question, however personal. Now i am trying to work out which one of those things i had not told you before..
I’m glad you enjoy my blog. I love this reply! I think you are open but not brash. And that’s admirable in the age of social media where everyone and everything is put on display! Glad I get the level right 😄. Brashness really turns me off as it often comes over as unkind and that goes against everything I believe in. No. 6 my friend. I didn’t know you had never framed and hung any of your artwork in your own home! Oh I will ask you “why” eventually 😉 But for now I’ll let you think about those reasons… Perhaps it is relate to #3? I am taking care of your health dear lady. You are recovering from pneumonia! Ask away when I have had a chance to think about it! You are very welcome Paula. I was thinking of Boris when I wrote that bit actually😊. Give the lad a pet from me. Ah, Molly likes those too when she is at our house with the stove lit! I have often thought about that microscope waiting for you to take it home 🙂 I bet it is beautiful! I know the feeling it would be quite tempting for me, too. You should try scuba diving, it is so much fun and you don’t have to be a great swimmer. Congratulations. Loved to read your answers and learn more about you my friend. It was indeed very sad. Such a beautiful room. No rush my friend, I have several pending too and I’m not that good with it myself. Even though it’s always an honor.